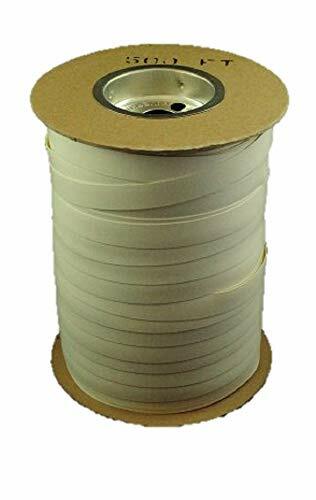 Batten Tape is great for attaching plastic covers to greenhouses, for covering the ends of greenhouses, especially around the doors or other openings, or attaching temporary covers over cold frames. It's also great to hold tarps over construction projects. Formulated to resist extreme cold and UV radiation, Batten tape is designed to be tacked or stapled over greenhouse film to a wood or plastic surface securing the film to your structure. This vinyl batten tape provides a quick fastening method for stapling plastic film to wood framing. Just staple every 4 inches through the tape and the plastic film into the wood. The tape will hold the plastic film in place without tearing. The tape is very flexible and easy to use -- unroll, hold in place, and staple. It is white and contributes to a neat and attractive structure. UV protected to resist cracking. Installation is simple. Pull tape taut before stapling. Staple at least every 4 inches, using a minimum of 5/16 staples. For a tighter seal, staple every 2 inches. During cold weather, keep the tape in a warm place before use. Where wind might be an issue, use a double line of tape. To remove the plastic film, pull on the tape and the staples will come out. Flexible and easy to use white vinyl strips 3/4 inch wide and 1/329 inch thick. Great for holding down tarps over construction projects. Batten Tape is great for attaching plastic covers to greenhouses. Designed to be stapled or tacked to wood and plastic. This vinly batten tape is formulated to resist cracking from the cold. If you have any questions about this product by Growers Solution, contact us by completing and submitting the form below. If you are looking for a specif part number, please include it with your message.